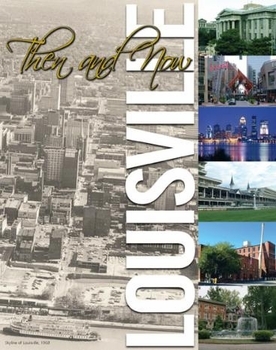 Sorry, Louisville Then and Now is out of stock. Email info@butlerbooks.com to learn more. To document the amazing transformation of Louisville from a sleepy river town to a dynamic modern city, Greater Louisville Inc. - The Metro Chamber of Commerce - has partnered with Butler Books and the University of Louisville Photographic Archives to present this 240-page collection of vintage and contemporary photographs that convey the fascinating story of Louisville's growth and evolution. As the hundreds of comparative photographs attest, Louisville has changed dramatically since the turn of the century but has managed to retain much of its architectural charm and sense of place. The book is a pleasing blend of history and progress, portraying the changing landscape of Louisville's downtown and its landmark buildings, neighborhoods, parks and points of interest. Through side-by-side images, the reader sees the city transform through the lens of time. Captions compiled by an all-star cast of local historians accompany the photographs. Introductions by GLI President and CEO Joe Reagan, University of Louisville President James Ramsey, and U of L Archivist/Louisville Metro Council Member Tom Owen set the stage for the reader's photographic journey through Louisville's evolving landscape.